Flowers were among the much appreciated gifts of kindness I recently received. I began writing this piece as a reflection on rebounding from some personal trauma, but I am a slow writer and events overtake me. My challenges actually coincided with the Orlando shootings. Of course, trouble and pleasure are both constant visitors on the micro level (stubbed toes and flowers) and the macro (an awesome Pope and drowning refugees). And, they’re inter-connected: our personal happiness or lack thereof dramatically affects our ability to contribute to the greater good, while the greater good or seeming lack thereof similarly impacts our own capacity for joyful living. That is why I advocate as strongly as possible for both personal happiness and a Gross National Happiness paradigm. Both matter. A lot. Still, following the killings of black Americans Alton Sterling and Philando Castile — as you all probably know, two seemingly unjustified executions by police officers — and then the targeted executions by a sniper of five police officers keeping the peace at a Dallas Black Lives Matter protest, my personal musings just seem so damned trivial. Yet, where else can we start but in our own hearts and souls? My story starts with a winter memory of kindness, a day several passing motorists stopped to help get my car unstuck from an ice-coated driveway. When I thanked them, one of the strangers thanked me right back, for giving him the opportunity to be helpful. These last few weeks I’ve been remembering that normal, “simply because it is right” interaction because it left me focused on the “helper’s high” the kindness giver may feel, rather than the profound gratitude that may flood the recipient. For that learning, I apparently needed more than the minor annoyance of a stuck car. A threat to my left eye created a mile-wide vulnerability ability to receive kindness. I am sure the loving kindness that enveloped me hastened my emotional recovery. Indeed, accepting and appreciating that kindness is a definite benefit of my frightening encounter with (limited) vision loss. Since the incident is still fresh, I don’t yet have perspective. I don’t know for sure if the treatments will work, though the doctor assures me the odds are “heavily stacked” in my favor. I don’t know if the sight in my left eye will ever improve. Meanwhile, the possibility of the same problem arising in my right eye is very real, although here again the doctor is reassuring. That’s a lot of unknowns. Rather important unknowns. However, I do know some things. First, I know that it was a traumatizing shock to hear that I was in danger of losing all vision in my left eye without immediate, frightening treatments. My response to be quiet, turn inward, and focus on my own feelings and healing was apparently both appropriate and effective, as my spirits rebounded substantially within a week of the first treatment. Whatever the reality of my vision, I feel like myself again. Research shows that happier people may be more resilient. Perhaps I had the science of happiness on my side. Second, the treatment wasn’t as bad as I expected. Obviously no one wants a shot in the eye. For some reason, I assumed the injection would be in the pupil, a particularly distressing prospect. But it wasn’t the pupil, it wasn’t that painful, the eye wasn’t even especially sore afterwords. A little freaky, but I can let go of ruminating over an unfounded fear. Third, I know I am lucky to have insurance coverage for this doctor and these treatments. This was almost financially disastrous. The first retina specialist my optometrist connected me with is outside my insurance coverage region, which would have meant an $1800 deductible followed by an ongoing 30% co-pay. Both a retina specialist and the vision-saving drug are likely exceedingly expensive. If the current doctor had not been available, I would obviously have gone to the first recommended specialist. There would have been no real choice, even if saving my vision led to bankruptcy. I am simultaneously grateful for my own good fortune and horrified that the minefield I dodged exists at all! Fourth, Facebook and other social media were a godsend. While I am an extrovert who generally gets a lot of energy from face-to-face relationships, for about a week, I needed to cocoon. Social media provided a way for me to reach out, and for others to respond. The morning of my first treatment, when I read the outpouring of caring responses to the blog I published the night before, I wept with appreciation. The love I needed was there for me, thanks to the oft-maligned internet. Gift of time. My husband, friends, and the nature of my work and responsibilities at this stage of life allowed me to back off from everything that did not serve my needs. Again, I know I am fortunate. And grateful. Gift of writing. Sometimes writing feels like a burden to me. In this case, writing allowed me to articulate the experience as I saw and felt it, giving me some sense of control over my own story. I was so grateful to be a writer, especially when others told me that my story somehow inspired or helped them. Amazing! To be able to help others in my own time of pain, it blows me away. Gift of reduced negativity. My initial diagnosis happened the day before the Orlando massacre. While I normally follow the news pretty closely and cry with much of the world’s heartbreaks, this time, I limited my exposure. Being a good citizen is important to me, but I had to take care of myself first. This, by the way, is a gift each of us can give to ourselves when we need it. Gift of modern medicine. Big pharma gets a bad rap for greed and money-fueled lobbying, but today I am very thankful for the drug industry. Until recently, doctors had no way to help patients who developed the same condition I have. My doctor told me, “We could only watch helplessly as they went blind.” The drug that is saving my eyesight has been in use for just 10 years. Wow. So grateful. So lucky. Gift of Good Luck. Ferruci notes in his kindness book, that luck is largely a result of mindfulness, of noticing the goodness in life. In addition to the medicine and the insurance, here’s another piece of luck I noticed: the flashing symptoms that sent me to the optometrist in the first place. Those symptoms were unrelated to the condition that exam discovered, yet without them, don’t know when I would have noticed that the vision in my left eye was deteriorating. Since my right eye was working overtime to compensate for the left, what luck to have flashing! Again, I am grateful. Above all, gifts of love. My husband, who spent many hours waiting in doctors’ offices with me; my friend Ulrike who told me to go ahead and cry at her birthday brunch if that’s what I needed (I did); the flowers, gift certificate, offers of whatever help I needed; even my son’s compliment on my writing skills — the gifts came in many forms. I savor them all. Each alone and all together, they mean so much. So now I know. Receiving kindness can be just as sweet as giving it. May we all embrace both, wholeheartedly. Beignets for breakfast in Lafayette, Louisiana. It was Mardi Gras season, and I was excited to rejoin The Happiness Walk in Baton Rouge, Louisiana. We were headed west toward Houston, right through Lafayette, Louisiana — the Happiest City in America. Since the Happiness Walk is all about gaining a deeper understanding of individual happiness, we made Lafayette our headquarters for a week. Let’s just say I didn’t lose any weight. Clearly, food is a big part of the happiness recipe here. One woman told me, “If we’re not eating, we’re planning our next meal.” From beignets to etoufee, shrimp gumbo (did you know you can put potato salad in gumbo instead of sour cream??) to boiled crawfish and white chocolate bread pudding, and other delectables I enjoyed tremendously but don’t remember how to pronounce or spell, Louisiana food is heavenly. Savoring is a highly recommended happiness strategy, and lots of savoring goes on in the Lafayette environs — even a seemingly ordinary convenience store was filled with enticing aromas, emanating in part from the tastiest onion rings I’ve ever eaten. Additionally, food here seems often to be created and dished out lovingingly, as well as received gratefully. Pleasure and kindness combined. All good. Is it really coincidence that five other Louisiana cities made the top 10 list in a 2014 academic report? The researchers used data from the highly respected Behavioral Risk Factor Surveillance System. In contrast, my food assertion is founded largely on non-scientific, non-rigorous personal experience — which also tells me there’s more to the story than food. The full Louisiana happiness recipe contains many other ingredients. A Listening Tour: Let me back up and explain a bit about The Happiness Walk, which is part of GNHUSA. Essentially, this step-by-step enterprise is one big qualitative research project. From Stowe, Vermont in August 2012 to Washington, D.C., down the eastern seaboard to Jacksonville, Florida before turning west, The Happiness Walk records thousands of interviews with “regular” people all along the way. By the time we hit Los Angeles, then Seattle, and finally arrive home in Vermont in late 2018, we will have listened to many, many thousands of people share what matters most to them in life. The interviews will be transcribed, and the data analyzed by academics. Our listening is heartfelt, and the interviews are voluntary. Here as elsewhere, not everyone wanted anything to talk with us. Wherever we listen, it’s not a quantitative scientific sampling. Still, we did find Lafayette to be especially happy. A surprise trip to a Mardi Gras parade in New Orleans, topped off with a souvenir gold lame pantsuit! Beyond the data, there was an intangible joie-de-vivre (joy of life) on this trip. Everywhere, the motto seemed to be laissez les bons temps roulez (let the good times roll) — no matter life’s very real challenges. That spirit was on full display when we arrived at our host Jeannette’s house just in time for a party with gumbo, etoufee, and King Cake. Many of the guests that night belong to the “Bluebirds,” a cancer survivor’s group. They were celebrating one Bluebird’s birthday — but they were also celebrating and grieving Cecile, another Bluebird who had died of breast cancer just a month earlier. This is not fake, pasted-on-smiles happiness. These folks are not in denial of the bad stuff life dishes out. Since Lafayette is an oil town, and that industry is struggling, the area is facing serious economic turmoil with foreclosures and lay-offs. We heard all too many cancer stories. And we were told of widespread poverty in the region. There’s plenty to cope with. Letting the good times roll seems to be a well-tuned coping mechanism. Heritage. The whole trip, we were in the thick of French Acadian, or Cajun, culture. At Jeannette’s party, I asked one of the guests how other people could be as happy as they all seemed to be. “You have to be born here,” was the reply. Families. Everywhere we go, we hear how important families are, but there was a different flavor here. Seemingly, Acadian families stay close together — all the better to let the good times roll. We met a man in nearby Krotz Springs who was paralyzed from the chest down in an automobile accident. Yet he told us he is a very happy man, in part because he’s built a wheelchair accessible party room and deck, with space for boiling crawfish with all the grandchildren. Fun. Then there was Andrew in Arnaudville. He showed us his newly-renovated family homestead, complete with a huge deck and covered cooking area, and camper hook-ups, so his whole family can come have fun together. And let us not forget the distinctive Cajun music and dance, which we enjoyed very much on a night out with Jeannette. Faith. We hear this a lot, too, especially in the South. Here, though, people didn’t seem to wear their faith on their sleeves as much as other places, perhaps because Roman Catholicism is the dominant religion. It all felt much more laissez-faire. My biggest takeaway? I’m not Catholic, I don’t speak French, and, sadly, I don’t think there’s much hope for me in the food department. Instead, I want to lift up the joy. I want to celebrate more! Last Saturday, I donned the gold lame and Mardi Gras beads. I just might wear them this coming Saturday, too. It’s not a natural fit, but you know what they say: laissez les bons temps roulez! An unexpected pleasure: brussel sprouts for lunch. It’s been five months since I was last on the road with The Happiness Walk — a project I love being part of — so I was naturally eager to fly to Baton Rouge today to once again join lead walker Paula Francis. I had managed to carve out two weeks walking time, just barely enough to cover 150 miles to the Texas border. Since I’ve never been in either state, I look forward to richly experiencing Louisiana and seeing at least a sliver of Texas. That’s geekily exciting. Plus, a third brand new happiness walker — my friend and neighbor Marilyn — is traveling with me, which guarantees even more good times. Yesterday while I packed, my mind was primarily focused on Louisiana’s weather. The 10-day forecast shows swings from 36 degrees some mornings to the high 70s one or two afternoons. That’s quite a range when you’re walking, and carrying everything in a backpack*. Deciding what clothes to take occupied a lot of my grey matter. Still, going somewhere means leaving someplace else behind. In this case, I am leaving home, temporarily stepping away from my husband, choir, yoga class, snow shoeing — and, a perfectly good batch of plump brussel sprouts. The sprouts gave me a moment’s distraction when I realized they would go bad in my absence. My husband’s hate of brussel sprouts is legendary among his siblings; he certainly won’t eat them. But … I had no time to eat them yesterday, and I had a plane to catch today. Apparently there was this little snowstorm over the weekend? A little blizzard that shut down Broadway? Not a drop fell in Vermont. Nonetheless, when Marilyn and I arrived at the Burlington airport we were informed in no uncertain terms that we were not flying anywhere today. Of course, I wasn’t totally surprised. Marilyn was even less surprised than me. We had gotten an email two days before letting us know that part of our itinerary — the part involving Newark — had been canceled. Still, I was hopeful. I guess I overlooked the fact that Burlington is a very small airport, with limited options to begin with. Here’s where the happiness training kicks in. In the stating-the-obvious-department, I’ll note that it is easy to be happy when everything is flowing smoothly. The rewards of a regular happiness practice to cultivate one’s inner resources show up in life’s bumpier moments. Today, for example. I was naturally a little disappointed, but I was also grateful. The woman behind the counter made it clear just how lucky Marilyn and I are to be able to fly out tomorrow. So, yay for that. Gratitude is so powerful, and also a strategy that most anyone reading this blog is probably quite familiar with already. There is usually so so much to be grateful for, from the macro (I mean, holy cow, what a great trip we get to go on tomorrow!) to even more macro (we both have such lovely husbands, one of whom delivered us to the airport and one who brought us home). And I had a lovely cup of English Fog tea while we waited — an opportunity for savoring and gratitude. Then there’s perspective, which you could also term mindfulness. This storm caused massive inconvenience and disruption to millions of folks up and down the East Coast. We weren’t exactly singled out. Again, you could put this in a much bigger perspective — as in, talk about first world problems. A trip delayed by one day? Not even worth sighing over. And then there’s reframing, or benefit finding. I remembered that Paula had not felt well yesterday, so could see a possible silver lining here: waiting for us to arrive, Paula can take a full day to recuperate if she needs to. Not only that, I could eat the brussel sprouts! I kid you not, when we were settled in the car heading home, I happily told Marilyn and Larry all about the brussel sprouts waiting in my fridge. I didn’t actually do a great job of cooking them, but I savored my lunch nonetheless. And, I get to go to yoga tonight! Life is good, even if now I might not get to Texas. And, if I’m not on that plane tomorrow, I might have to dig a little deeper. But for now, I can go do downward dog with a smile on my face. Hopefully, we won’t have to carry our packs while we walk. Part of the Walk’s magic is all the helpers we meet, including those who transport our stuff. Here’s what I ate the weekend ISIS attacked Paris: pizza on Friday night; leftover pizza for breakfast, a big bowl of buttered rice and veggies at lunch, and pasta for dinner on Saturday; and on Sunday, granola for breakfast, ravioli for lunch, and more rice and dal for dinner. Here’s how much I exercised: not much. Mostly I was a love seat potato. I sat bundled under a blanket, just me and my laptop, with its images and articles about the Paris and Beirut terrorist attacks. I made myself watch the disturbing home video of the exterior of the Bataclan Concert Hall, a video shot as concert goers escaped the killing. I forced myself to read a lengthy March 2015 feature in The Atlantic, “What Isis Really Wants” and other articles that spelled out how globalization and climate change would continue to create conflicts over scarce resources. As I immersed myself in learning, I questioned my choices. Should I really be drenched in so much negativity? After all, I consciously never watched any Isis beheadings. I felt the same way for a long time about watching videos of unarmed black men being fatally shot by police officers. Eventually I decided that it was my responsibility as a United States citizen to watch some of those videos. Saturday, I felt that same responsibility as a citizen of the world. As soon as I heard about the carnage in Paris, I believed we had slipped into something like what Pope Francis called a “piecemeal third world war. I had to know more –and even more, when I found out about Beirut. Why wasn’t that city receiving the same media coverage and sympathy? Do Parisian lives really matter more than Lebanese? What was going on? I plowed doggedly through the weekend, with my body taking on what my mind wouldn’t let me feel. Not that all this information provided answers. It is a big, nasty, complex mess requiring tough choices by people with higher pay grades than mine. However, it is clear to me that both systemic and personal happiness thinking and strategies have important roles to play in the upcoming days, weeks, and years. When you combine climate change with its droughts and natural disasters, along with the demands of an insatiable growth economy, the result will be wars, famine, and refugees. Warning lights are flashing and the sirens are going off: we need to move toward a new economic paradigm of well being, much like that advocated by Gross National Happiness USA. On the personal side, to stay sane and productive no matter how all this plays out, we need to invest in: nurturing and savoring relationships, growing community,building resilience, living with gratitude and meaning, practicing forgiveness (maybe not of ISIS just yet, I’m no saint), experiencing joy in the here and now, and tending to practical matters like getting a good night’s sleep. Perhaps the two most important personal happiness strategies are kindness and permission to be human. Some of the necessary kindness will be on a grand scale, like the Beirut father who tackled a suicide bomber, thus sacrificing his own life but saving scores of others, including his own little girl. Some kindnesses will become viral, like the man who saved the pregnant woman’s life in the Bataclan video. But for most of us, most of the time, our kindness and compassion will be small because we are only human. I learned the phrase “permission to be human” from the fabulous Tal Ben-Shahar. He helps happiness students understand that we can do ourselves and others a big favor by embracing the fact that we are beings with bodies, biology, emotions and sometimes very whacky brains. Permission to be human does not mean permission to misbehave, or to hurt another. It means sometimes being a lot angrier than we would like — or feeling a myriad of other less than desirable emotions. Last Saturday it meant my body compensated for all the work my brain was doing by demanding comfort food and lots of carbs. Permission to be human — that is where kindness can start. Cut our own poor hearts a little bit of slack. Then, with more compassionate hearts, we can radiate greater kindness and understanding to friends and loved ones. That day with my laptop, I was frustrated with friends who seemed too strident with their Beirut postings. Their reactions were different from mine, but no less valid. Permission to be human. The next day, when I asked a friend why he was only talking about Paris and not Beirut, he was shocked. He hadn’t heard about the Beirut suicide attackers. Not omniscient? Permission to be human, my friend. The next layer is sharing kindness and compassion with our broader communities. Later that day, I had the opportunity to do just that, when I found myself walking next to a friend of a friend. He was weighed down by personal troubles and shared some of his sorrow as we walked. Before going our separate ways, we hugged for a long time. Hugs. What a great expression of mutual kindness. Finally, in prayer and meditation, political action and choices, and our use of social media, we can extend our kindness and compassion to wider and wider circles — even to those we don’t understand, who infuriate and frighten us. But there are caveats and limits. First, being kind is not being spineless, as was powerfully demonstrated by the reaction of Parisians holding a vigil for victims of the ISIS attacks. When confronted by anti-immigrant protesters, the larger crowd rose up in love and forced the hate mongerers to back off. I also want to shout “Boo! Boo!”– and plan to do essentially that tomorrow at a counter protest in front of the Vermont Statehouse. In response to a previously scheduled anti-Syrian refugee, Islamaphobic protest, the word has gone out to rally in support of justice, fairness, and accepting Syrian refugees into our cold but loving state. I will be there. Second, there are limits. When I played Barbara Frederickson’s inspiring “Loving All” guided meditation for a meditation class this week, I just could not extend loving kindness wishes to “all.” Though Fredrickson urged listeners to emphasize “all,” I thought not only of ISIS but also of the hate-spewing, anti-Syrian, so-called political leaders. At this point in time, I just cannot open my heart to people engaged in such mean-spirited and dangerous tactics. Cultivating kindness and compassion is a lifelong practice. It can be challenging in the best of times, much less in these anxious days. I would never deliberately hurt anyone, but just now, if my heart isn’t as open as I would like it to be, so be it. Permission to be human. 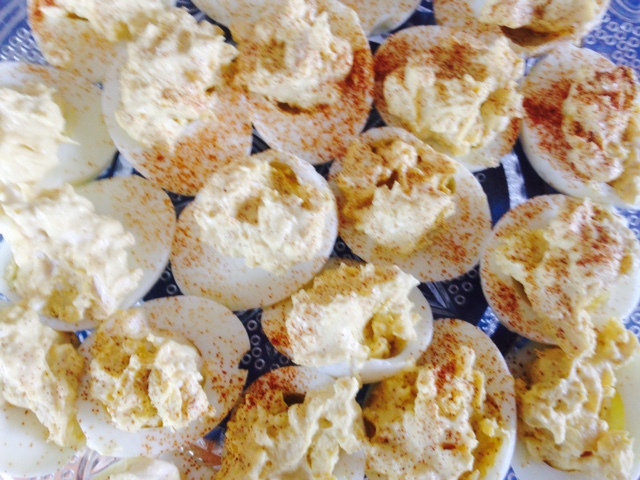 Deviled eggs for the reception following my friend Melanie’s memorial service. My friend Melanie passed away about a month ago. Though she died of natural causes, it still seemed sudden. Certainly she was much too young — only 56. Her memorial service was sad. Her widower and young adult children put on brave faces, but we could all feel their heartache, along with our own sorrow. Yet, paradoxically, funerals like Melanie’s can be an important piece of the happiness puzzle. This may not be true for all funerals. When my friend Kathy was murdered by her husband (who then committed suicide), her service was a wrenching river of sobs. Also, for the immediate family and closest of friends, the weight of grief and shock may be overwhelming for some time to come — though even for them, in the midst of pain, there is ample room for gratitude. For the rest of us, when people who are not children die because their bodies give out, funerals and memorial services can strengthen our individual and collective happiness muscles. Not that I was happy at the end of the day. I wasn’t. I was weary, and wanted to do nothing other than take a hot bath and drink a glass of wine. Spending my day making a couple dozen deviled eggs for the post-memorial service reception, then attending the service and reception, before collapsing sadly at home is not my idea of a good time. However, to live a meaningful life (without which true happiness may well be impossible), we have to do a lot of things we’d rather not. Just look at the other end of the life spectrum, and ask parents of newborns how much they enjoy sleep deprivation and all the other sacrifices they are making to raise flourishing children. Love, relationships, integrity — all come with a price tag. 1. Funerals allow us to feel our feelings. When I learned that Melanie had died, I sort of went numb. I was entertaining out-of-town visitors for several days, and had to focus on their needs and welfare. All I could think about Melanie was, “this makes no sense.” She was supposed to have joined me for a meditation class the evening before she died. I just could not wrap my head around the fact that she was dead. I knew I should be crying, but the tears wouldn’t come. Finally, finally, as I sat in a pew waiting for the service to begin, I could feel my tears begin, too. I wouldn’t say I definitely didn’t want want to attend the service, exactly. I knew that would be a time to learn more about Melanie’s life, and to give and receive love with fellow mourners. What I didn’t want to do was make the deviled eggs. Yet that too is love, and necessary. Nor did I want to make dinner to take to the grieving family. I’m not much of a cook, so these were the inconveniences for me. In my humdrum battle of “doing good versus doing nothing,” both heart and conscience dictated that I choose good. 3. Funerals build community. The deviled eggs and meal train obligations weren’t just for Melanie and her family — I was also upholding my community obligations. In 2001, we moved to this corner of Vermont because we wanted to live in a strong community, and boy, do we! When word of Melanie’s death spread, so did the phone calls and emails: who will sing in the pick-up choir? What meals does the family need, and who is organizing? How about the reception — how do we sign up for that? How about setting up, and cleaning up? What else does the family need? Our ability to come together is no accident. We work — and play — at building community, all year long, year after year, probably for several centuries now. We all do our part, in ways large and small, from helping to organize the winter Mardis Gras, marching in the Fourth of July parade, setting up tables for the Corn Roast — and, showing up for the funerals. Melanie’s service both displayed the strength of our community, and further strengthened it. Perhaps appropriately, a toddler’s birthday party took place in our community center just a few hours before the post-memorial service reception. The full panoply of life, made better by community. During the service itself, I marveled at and felt grateful for everyone in attendance. Melanie’s community. My community. We can all count on it, because we all show up. I was overwhelmed by the love and also the awareness that each of us is here only temporarily. At the reception, I hugged two (of many) cherished community members and friends, told each that I loved her and was grateful for her, and received similar warmth in return. I also spent a lot of time in the kitchen doing the dishes, because this is what community is all about. We share the joy, we share the grief, we share the cooking and cleaning up. We build community. 4. Funerals open the door to valuable introspection. A few winters back, I took a week long online happiness course from the Pursuit of Happiness folks. One of the assignments was to consider what we wanted the speakers at our own funerals to say. I think this is an incredibly valuable exercise, and one that naturally arises while attending a memorial service. What will be said about me? Maybe that sounds narcissistic, but I actually find it a helpful touchstone. As we go through our ordinary days, adding up to our lifetimes — what do we want that final tally to look like? That’s one aspect of introspection. The other is, what do you not want to regret at death’s door? You, me — who wants to be dying and say, but wait!! I always meant to (fill in the blank). Too late, then. When I die, I want to say, I am satisfied, not “I wish.” I want to be comfortable with having led a full, rich life. One that included funerals and deviled eggs. A life of love, service, fun, and courage. One that was as happy as possible. That’s what I’m working on. How about you?